Get off the beaten track and immerse yourself in Fijian life with this six-day escape to Crusoe's Retreat on the Coral Coast. 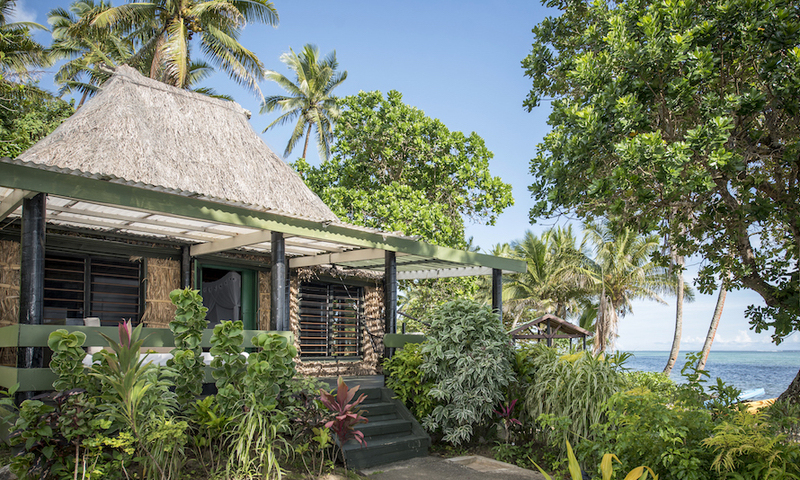 Promising ultimate relaxation and tranquillity, this beachside hideaway is perfect for those looking for a laidback pace, while offering the opportunity to experience genuine Fijian hospitality and village life. Start your day by wandering through the ten acres of lush tropical gardens, or along the palm-fringed sandy beaches; swim in the pool or the lagoon; opt to take part in resort activities, such as snorkelling, sea kayaking, beach volleyball, guided nature walks and more exciting excursions (not included); or simply lay back, relax and make the most of the secluded beach location. As part of your package, receive return international flights, daily buffet breakfast, massage and more; or opt for the all-inclusive upgrade option to receive breakfast, lunch, dinner and afternoon tea throughout your stay. The Sea View Bure is perched on the hillside overlooking fruit trees, beautiful gardens and some of the best beach and ocean views found anywhere. Each features a large bathroom and outdoor verandah area, and is situated within easy reach of the resort facilities. Sea View Bure All Incl. The Deluxe SeaView Bures are located on the dramatic hillside, above the main areas of the Resort, and are accessed via a series of stairs and strolling walkways. Each has its own private covered verandah with comfortable furniture and outstanding views. The large bedroom and sitting room area has a soaring ceiling and opens into a large bathroom. Deluxe Sea View All Incl. With a prime location in the tropical gardens and fronting a large lawn area that leads to the sandy beach and warm waters of the lagoon, the Sea Side Bure is ideally situated to access the beach, pool and resort grounds with ease. Each boasts soaring ceilings, a comfortable and spacious sitting area. 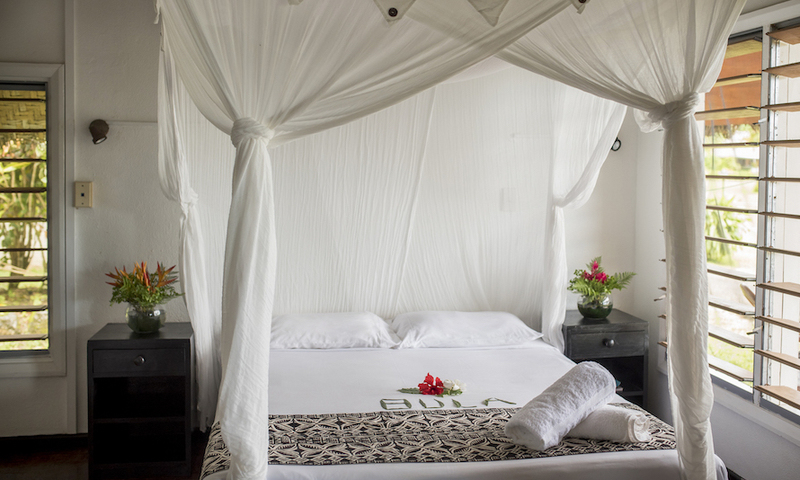 The bedroom is designed in a tropical fashion, and opens into the large bathroom. Fiji is truly paradise on earth, and the Coral Coast is arguably Fiji’s most popular destination. 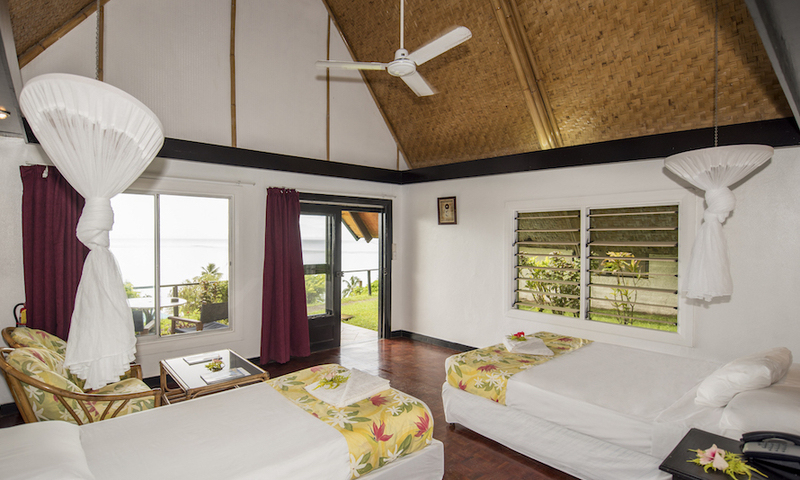 Crusoe’s Retreat, a tranquil oasis looking out to the azure sea, offers a perfect blend of traditional local culture, genuine Fijian hospitality, relaxed pace, fun activities and fresh island cuisine. The resort is located directly next to a local Fijian village. As guests of Crusoe’s, you will have the opportunity to visit and spend time with the Fijian locals - renowned as some of the friendliest people on earth. Crusoe’s Retreat is ideal for weddings, honeymoons, scuba divers, holiday makers, company retreats and anyone who needs a relaxing holiday. Crusoe’s Retreat is set amongst ten acres of lush tropical gardens and a palm-fringed sandy beach on Fiji’s famous Coral Coast. Situated on the main island of Viti Levu, and close to Pacific Harbour, Fiji’s ‘Adventure Capital’, Crusoe’s location is the perfect base to enjoy amazing scuba diving, take part in plenty of resort activities, or simply relax on a palm-fringed beach. The Deluxe Sea View Bures are located on the dramatic hillside, above the main areas of the Resort, and are accessed via a series of stairs and strolling walkways. Each has its own private covered verandah with comfortable furniture and outstanding views. The large bedroom and sitting room area has a soaring ceiling and opens into a large bathroom. Today you will depart from Sydney, Brisbane or *Melbourne with Virgin Australia, Fiji Airways and codeshare partners for your flight to Fiji. On arrival, please make your way to your accommodation or, alternatively, you can upgrade to the all-inclusive meal and transfers package available within this deal. Please note if you select the upgrade option you will be met by a hotel representative and transferred to your accommodation, where you will be welcomed and ready to check in. Wake up in absolute paradise. After breakfast, take some time to explore your surroundings. The day is yours to enjoy either relaxing by the pool or seaside lapping up the beautiful rays of sun as you snorkel around. If you’re feeling adventurous, take the opportunity to join in the many activities available at the resort (Not included). Make your own way to Nadi International Airport for your flight back home. If you have purchased the upgrade option within this deal, you will be transferred by a hotel representative to the airport in time for your schedule flight back home. Travel offer is valid for travel on selected dates until the 30th November 2019. This travel offer is priced per person based on twin share. Virgin Australia, Fiji Airways and Codeshare Partners (subject to availability). Due to recent changes, the resort will be an adult only resort from 1st April 2019, any children under the age of 18 years of age are not permitted. - Passenger information forms must be submitted 72 hours after purchase. - Bookings are essential and subject to availability. - Strictly no refunds for this voucher for amendments and change of date - fees are at the resort's discretion/policy. - Any changes to confirmed bookings are at the discretion of the property and charges may apply. - Travel insurance is mandatory. We suggest purchasing travel insurance as soon as possible after purchasing this voucher. - Voucher is non-combinable with any other promotions. Fiji has a warm tropical climate perfect for beachside holidays. Maximum temperatures rarely move out of the 31°C to 26°C range all year round. The Coral Coast has been a popular holiday destination for many years, it was one of the very first areas in Fiji to be developed for tourism. A tourist visa is not required if travelling on an Australian Passport.